Named for the saintly church that once stood on the same site, the monolith has an almost evil feel about it, stomping down on the Christian relics at its base. Although when up close, the building reminds me more of the black leather and steel furnishings that dominated inspirational homes of the 1980s, the design actually dates from the late 1950s as part of a wider scheme along the London Wall. It is also the last remaining tower block from that era to retain its original cladding unchanged from when it was constructed. The other five tower blocks from that development have long vanished, and this remnant is soon to go as well. I have never particularly liked the building, mainly thanks to the oppressive and unforgiving way it sits on the ground, with no major entrance foyer to welcome people in, it feels more like a fortress than an office block. Indeed, until I researched it, and thanks to the large amount of air conditioning vents on one side, I did wonder if it was a computer data centre and not designed for human occupation. The building sits on the City Highway, an elevated pedestrian walkway, which like most such structures of the time has been somewhat neglected and never quite lived up to its promise. 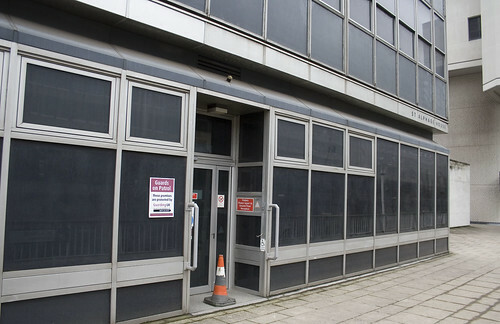 The walkway has been derelict since 2008 when the upper level pubs and shops that cluster around the monolith were closed down in anticipation of its then-imminent demolition. Remarkably, there were also six residential flats at the top of the building — although now vacant they were only accessible by a staircase from the 18th floor and used by City employees. The road below, officially London Wall, was codenamed Route 11 during the post-war planning years and built as part of a wider scheme based on the opinion of the time that the roads would be king. As such, the plans were scrapped, and what is left is an odd runt of very wide road that doesn’t really go anywhere. 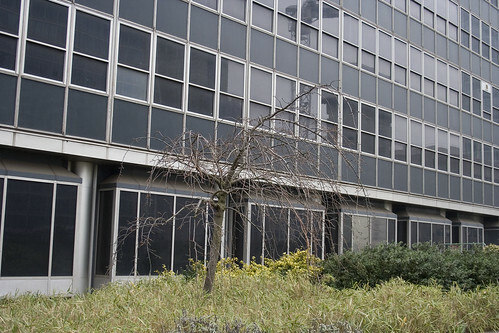 The interior was reportedly gutted in 2009 to make the building unusable, in order to avoid a £1.5 million annual tax bill while it waited to be demolished, and planning permission was finally granted for a replacement of the whole area with a series of new buildings in 2011. Part of the plans, while retaining the high-walkway will also take advantage of the wide road below to create more ground-level pedestrian spaces. I personally like the separation of human from road, but the elevated walkways need a lot of looking after if they aren’t to become social deserts in the urban landscape. The site was put back on the market last year though and the future of the site is still uncertain. 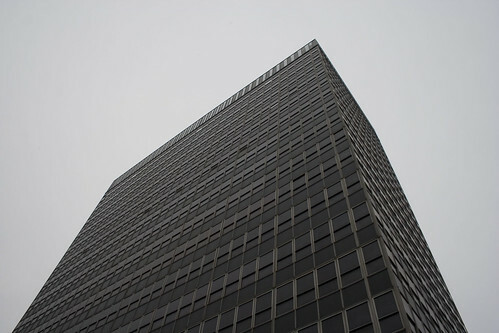 London’s black monolith could be around for a while longer. I’m looking for somewhere cheap to live – I wonder if those roof-top flats are still available? Your post has brought back a few memories. My third job was with a shipping company in St Alphage House in the mid to late 1980’s. Haven’t been back there for years so wasn’t aware the building was due to come down. Had a good few years working there and spent many an hour (and many pounds) in the pub you mentioned on rhe walkway. There was another pub called the Crowders Well nearby that we also used to frequent. Is that still open? 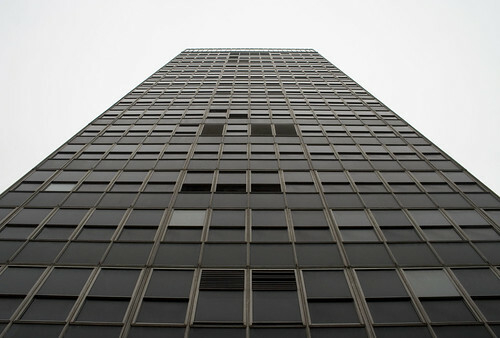 I worked on the 13th Floor in the late 1990s. The lifts all scraped against the lift shafts at various points due to the building twisting as the poorly built foundations settled. The basement was infested with rats and the drains backed up in heavy rain. I doubt it will be missed when it goes. Don’t forget to mention its still surviving younger brother, Bastion House, built within the same design envelope as the original five towers. Now styled 140 London Wall, you can still see the previous name in ghost writing on its exposed concrete frame. Last time I was around there, I’m sure I saw some of the shop name signs on the closed units showing phone numbers starting 01. Did you see these as well Ian? I didn’t pay deep enough attention to them to notice, but I might have a look the next time I am passing on the way to the Museum of London. London Wall is quite popular with taxi drivers though, especially if the traffic lights in the middle are green. Ugliest? I think you needed to turn around. Terry Farrell’s monstrous post modern Alban Gate (125 London Wall) has none of the elegant simplicity of the building it replaced (Lee House). It is currently being gutted but the exterior bulk is beyond redemption. The latest recladding of the last remaining functional block of the original five, City Tower, is nearly complete and it looks particularly smart in its new champagne coloured skin. The former Bastion House is now the shabby one on the block. It desperately needs a makeover, or possibly removal. I’m sure they could find something better to sit on it’s plinth if they tried. I actually quite liked the London Wall towers. Although not well proportioned – too stumpy – they were nice and sleek. St. Alphage is in terrible condition now, but I don’t think it is ugly. Bastion House and City Tower, as Jim says, are still occupied. That’s half of the original six – the other three were Moor House (replaced by the ugly new Moor House at the junction of Moorfields and London Wall), Royex House (between Aldermanbury Sq. and Wood St.) and Lee House (which was directly where Alban Gate now sits, and was the first to be demolished. Alban Gate is hideous. It ruins London Wall and creates a really baleful atmosphere where it covers the road. Blocks out the sun. I used to traverse the St. Alphage Highwalk daily in the early 2000s as I walked from Moorgate to my office in Aldersgate Street. The Podum and The Plough pubs were still open then. Great article, I worked there in the early 1980s for the maintenance department. We had a room in the basement area. It was a great place to work from the many characters to one floor having their own golden toilet !! Happy to chat to anyone who wants to know more.